Jobs growth on Main Street-a traditional driver of past U.S. economic recoveries-so far has been largely stagnant. Faced with challenges, from taxes to anticipated rising health-care costs , many small-business owners remain in a holding pattern. They're not making substantial spending decisions, including hiring. Given small employers' role in the broader economy, CardHub, a website for credit card, financial and jobs advice, has released a new ranking of the best and worst American cities for small-business workers and job seekers. In other words, if you prefer to work for a mom-and-pop firm, you may want to think twice about like Riverside, Calif., and instead focus on metropolises, such as Denver, according to the study. CardHub rated cities based on 10 metrics, including net small-business job growth, the variety of industries and small business vitality-a measure of small business concentration and growth. The analysis focused on small employers in the 30 largest U.S. metropolitan areas. "There are a lot of surveys looking at the best places to start a business for entrepreneurs. But there's been little on the other side of the coin," said John Kiernan, a senior analyst for CardHub, based in Washington, DC. While the nation's unemployment rate is at 7.6 percent, an alternate rate that counts discouraged Americans who've quit looking or are underemployed is nearly 14 percent . "Given how tough the job market remains to be following the recession, we thought it would be interesting and helpful to look at where the most opportunities are," Kiernan said. For select cities that ranked among the bottom of the CardHub list, including San Diego, Philadelphia and Sacramento, trends that worked against them included wide exposure to the housing downturn and still weak regional economies. Riverside: This Southern California community experienced a massive run-up and collapse in housing prices over the past several years. Among the 30 cities CardHub evaluated, Riverside ranked last in terms of number of small businesses per capita, small-business vitality and unemployment rate. Detroit: Bailouts helped prop up the Motor City. But Detroit's small-business community continues to be hit by one of the lowest number of small businesses per capita-22 among the study's list of 30 cities. Detroit's net small-business job growth came in at 27 out of 30; and 26 out of 30 for industry variety. Of course, not all Detroit entrepreneurs agree with the "worst" moniker. "I think the overall mood in Detroit is still positive," said Joseph McClure, founder of McClure's Pickles. A Michigan native, he transformed an abandoned American Axle & Manufacturing warehouse in Detroit into a new pickle factory. In Detroit, "real estate is going up due to the affordable prices, restaurants and business are popping up," he said. Boston, Minneapolis and Seattle ranked among the best for small-business workers and job seekers. They collectively boast high small business per capita, low unemployment rates (suggesting less competition for available jobs) and a variety of industries. San Francisco: The Bay Area ranks six among 30 in most small businesses per capita, five for small-business vitality and net small business job growth. The city also offers the second-highest wages to new hires. That is due, in large part, to having a minimum wage in the city of $10.55 an hour, the highest in the nation. 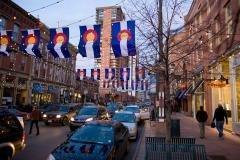 Denver: The Mile High City tops the list in part because it has a high concentration of smaller employers. About 97 percent of Colorado employers are classified as small businesses, according to CardHub's study. Denver's workforce is also growing at the second-fastest rate in the country, and ranks fifth for highest wages for new earners. New small-business hires make the most money in Washington, D.C., San Francisco, and New York, where cost of living is high, according to the study. New earners make the least in Riverside, Sacramento, St. Louis-all in the bottom half for cost of living. The city rankings come as more Americans seem to be willing to relocate for jobs, or strike out on their own. "Anecdotally we've seen people display more of a willingness to look for jobs in a variety of different areas-both geographically and in terms of what they're doing on a daily basis," said CardHub's Kiernan. Others are creating their own opportunities. A separate study shows more U.S. entrepreneurs are launching ventures based on perceived opportunities, growth ambitions and a broad optimistic outlook-a group sometimes called opportunity entrepreneurs . U.S. entrepreneurship activity rose to the highest level in 14 years, according to a 2012 Global Entrepreneurship Monitor report. In May, U.S. small-business optimism rose to a one-year high. It was the second straight month of gains for the National Federation of Independent Business Small Business Optimism Index. But the broader economy, including small businesses, are adjusting to higher taxes and deep government spending cuts. Bottom line: The small-business half of GDP is not generating growth beyond population gains, according to the NFIB. "We've made a lot of progress, but we're still kind of gloomy about the future," NFIB Chief Economist Bill Dunkelberg told CNBC earlier this month. "And if you're gloomy about the future, you don't spend money, you don't hire. And that's kind of where we sit."